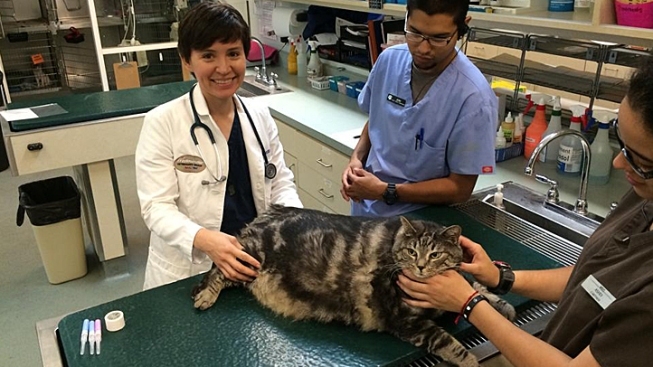 Little Dude, a 36-pound cat, with animal care workers in summer of 2014. A morbidly obese rescue cat named Little Dude is eating healthy and working on his fitness in preparation of being put up for adoption, said shelter officials in Orange County. Handlers said the 10-year-old short-haired feline arrived to WAGS Pet Adoption in Westminster in August weighing a hulking 36 pounds - roughly three times what his normal weight should be. "He is the equivalent of the news stories that you see of humans that are being forklifted outside of their houses," said Cortney Dorney, the shelter manager. 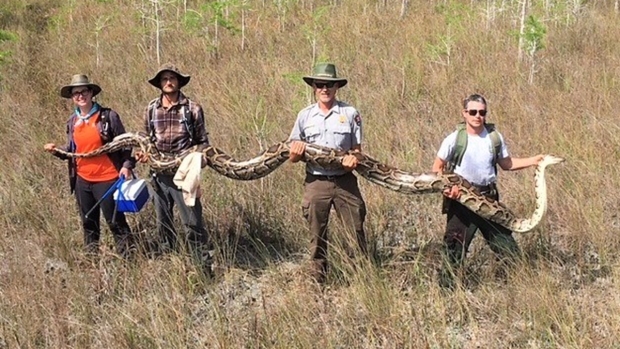 "I can tell you that in my 20 years of doing this I've never seen a cat this size." Little Dude's owner turned him over to WAGS because he said he couldn't pay an added charge at his apartment complex for renters who owned pets. When the cat arrived, the shelter staff said he needed immediate medical attention - Little Dude's weight problem likely stemmed from eating too many treats and human food, and not enough physical activity, officials said. "His sheer size was detrimental to his health," Dorney said. Little Dude, who has put on a strict diet, was down to 33 pounds at his last weigh-in, but he's shedding pounds too quickly due to stress, so he's being fed with a tube to stabilize his weight loss, Dorney said. It could be weeks before he's ready to be put up for adoption. "He's fabulous," Dorney said. "He's very laid back and easy going - because of his size he doesn't have a choice. He's a lap cat. He just wants to hang out and be brushed." Anyone interested in adopting Little Dude can begin the process by filling out an application at the WAGS website at wagspetadoption.org or by calling the shelter at 714-887-6156.